“They’ve basically threatened to hold up the entire funding process for a bailout of CPS. Let me be clear, that is wrong," the governor said. During a Statehouse news conference Monday, Gov. Bruce Rauner claimed Democratic leaders were holding up the state’s education budget for a bailout of Chicago Public Schools. “They’ve basically threatened to hold up the entire funding process for a bailout of CPS,” Rauner said during his speech. “Let me be clear, that is wrong. That is unfair." “People across the state should not be held up with their tax money to go bail out Chicago Public Schools,” he added. The state’s lingering budget impasse will likely stretch into its second year Friday. 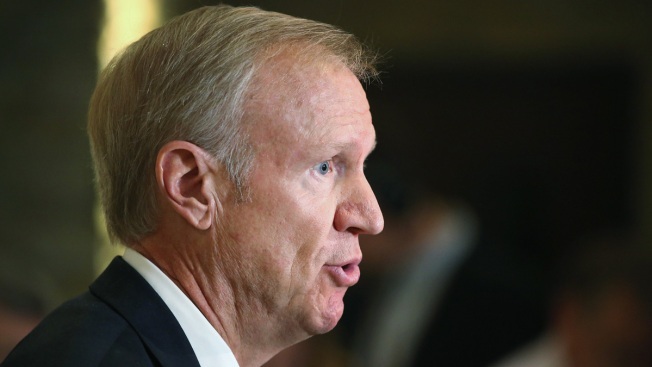 Rauner warned that if bills to fund education and other essential state services aren’t passed soon, elements of the government could shut down after July 1. Last month, as it was becoming clear that lawmakers weren’t going to come to a budget agreement before the end of the spring legislative session, Rauner announced stopgap funding bills for K-12 education and other essential government services, like state colleges and social services. Rauner has spent most of June touring the state pushing the funding measures. During his speech Monday, the governor said he reached out to the state’s top leaders in hopes of organizing a meeting Tuesday to discuss the bills. A meeting between Rauner, House Speaker Mike Madigan, Senate President John Cullerton, House Minority Leader Jim Durkin and Senate Minority Leader Christine Radogno is slated for 4:30 p.m. Tuesday. Lawmakers are expected to vote on the two funding measures during Wednesday’s special legislative session. Rauner said lawmakers “pretty well have an agreement” on the stopgap to fund essential services, which will keep the state's government operating for half a year, but said he was far less confident about education funding Monday. “President Cullerton in particular, along now with Speaker Madigan, what they’ve said is, ‘No deals, no budget unless the funding formula changes and we get a lot more money for Chicago Public Schools,’” Rauner said. Madigan spokesman Steve Brown claimed Rauner's "regional divisiveness is one of the reasons he is failing to achieve his goals" and that the governor's "meager additional school funding" was already rejected by both houses of the General Assembly. "More work is needed on statewide school funding," Brown told Ward Room. Rauner's plan would increase public school funding by $235 billion. According to the Associated Press, Senate Democrats plan to put forward an alternate education funding plan Tuesday that would increase funding by $750 million. During Monday's speech, the governor claimed CPS “has been financially mismanaged for years and years” despite funding from the state. Rauner pointed to the state's contributions to teacher pensions, which has cost about $60 million a year, as well as a $200 million block grant. Rauner criticized the district for not funding their own pensions and using the school system “for patronage and political purposes” instead of education. Rauner also chastised Mayor Rahm Emanuel for reportedly moving to gain City Council approval for the authority to buy CPS debt. According to the Chicago Tribune, Emanuel proposed a change to Chicago’s investment rules that would allow the city to buy debt from its sister agencies, like CPS, the Chicago Housing Authority and the Chicago Transit Authority, among others. The plan looks to give the treasurer the option of investing in bonds, short-term loans or other types of debt from the district. But, because CPS has a junk credit rating, it would be difficult to borrow money through traditional channels. Nevertheless, short-term borrowing could give CPS a way to continue operating while the state figures out a funding solution. Rauner said it was good that Emanuel acknowledged "that the city needs to step up and start to deal with their own problems,” but claimed the plan was simply "kicking the can down the road." “All that does is almost guarantee an even bigger tax hike later on for the city residents of Chicago. that is wrong,” Rauner said. “That is a failure of the leadership, that is failure from the mayor." During the speech, Rauner also asked why Emanuel wasn’t working to apply Senate President John Cullerton’s pension reform plan to Chicago’s teacher pension. Moreover, he asked why Emanuel wasn’t working with the General Assembly to make bankruptcy an option for CPS. Rauner accused Emanuel of caving to the Chicago Teachers Union during their 2012 strike, claiming that taxpayer-funded unions get what they want from politicians through threatening to strike “or other intimidation.” Rauner claimed Emanuel could have used bankruptcy as an option for leverage in negotiations. Emanuel's administration responded to Rauner's onlslaught Monday evening. "The governor has admitted the education funding formula is flawed - and it shorchanges children in Chicago and in high-poverty areas accross the state," Emanuel spokesman Adam Collins told Ward Room. "Rather than stand up and do what he was elected to do, the governor is now advocating for a stopgap budget with no reform, no long term solutions and one that doubles down on the failed education funding model that led to the crisis Illinois is in today."